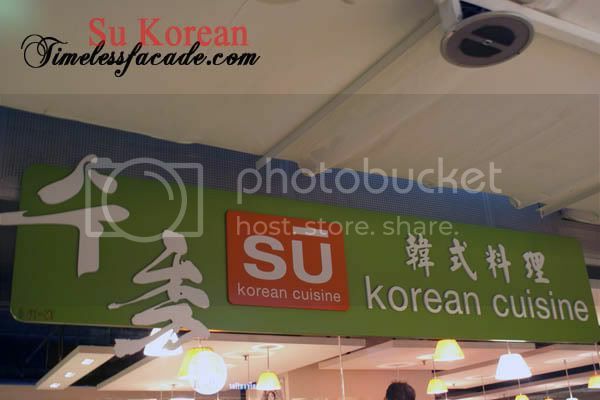 Happened to be at Far East Square and was looking for a cheap lunch venue when I stumbled upon Su Korean Cuisine, which offered a set lunch at $10++/pax - a seemingly good deal in this part of town. 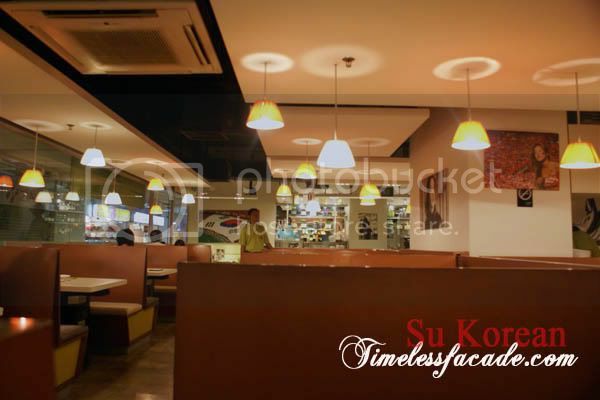 Located at the basement of this teenager centric shopping mall, Su spots a cafe like interior with plenty of booth seats and minimalistic decor. 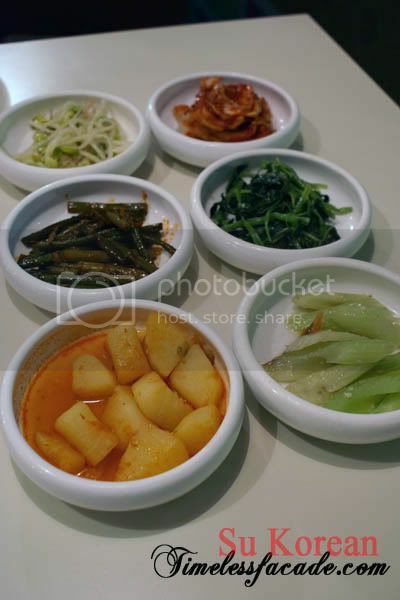 I've always had the notion that the side dishes in Korean meals make the entire meal more bang for the buck because of the variety of dishes you get to sample. However, more often than not, the quality would be very average (based on the limited experience I have with Korean food). Su's offerings weren't an exception. As mentioned in my post on Auntie Kim's, I've never really been able to appreciate Korean food and whatever it entailed. The chicken slices were tender but I didn't quite take to the sugary sweetness of it. 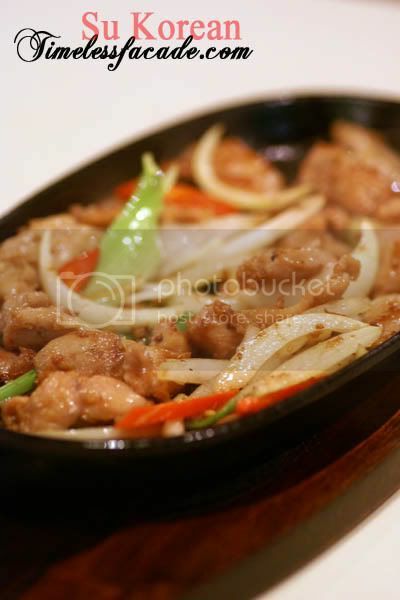 The proportion of garnishes to chicken meat was also quite high, which meant that the meat ran out pretty fast. 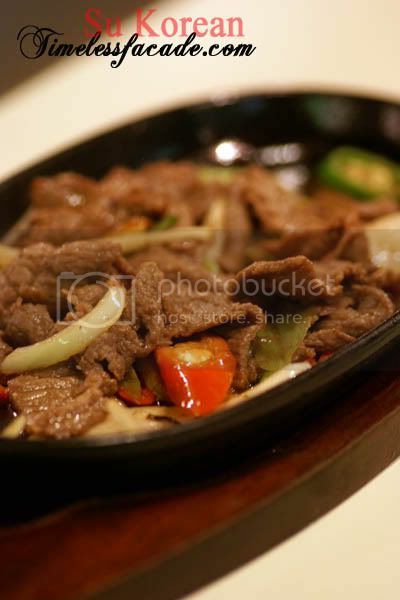 Another overly sweet dish to me, the beef slices were relatively tough and dry without much beefy taste. As with the BBQ chicken, portions were also found wanting. 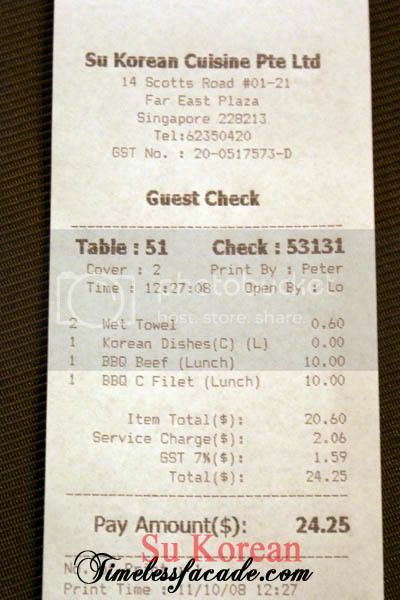 I guess $24 for a relatively filling lunch in an airconditioned environment in town is still reasonable by certain yardsticks. Food quality is average to me but that may be due to the fact that I can't really appreciate Korean food. I don't like this restaurant. I think it's not very authentic and overpriced. You can get much better Korean food elsewhere. Togi? Sounds familiar. Thanks ice! hmm i remember going to a korean place at dempsey, which was really good but i cant recall the name now. I think it's Chang Korean BBQ Restaurant. otherwise, crystal jade's korean ginseng chicken and bbq is not bad too, the one at ngee ann city? Hi ice, I've been eating at the meridien food court stall since 2005 lol.